The second Medici to wear the papal tiara in three pontificates, Clement VII’s tenure was marked by his relative inability to make progress in the face of political and ecclesiastical challenges. Together with his cousin, Leo X, he represented nearly twenty years of Medici governance in Rome and he stood in stark contrast to his more reform-minded predecessor, Adrian VI, and successor, Paul III. Born Giulio de’ Medici in Florence on May 26, 1478, he was the illegitimate son of Giuliano de’ Medici and his mistress. Giuliano was murdered shortly after his son’s birth, so the boy was taken in by his wealthy uncle, banking magnate Lorenzo the Magnificent. There the future Clement would be raised alongside his cousin, the future pope. When Leo rose to the pontificate in 1513, he named Clement archbishop of Florence through a dispensation from canonical restrictions against illegitimate children attaining ecclesiastical office. Later that year, Leo would elevate him to cardinal of Santa Maria Dominica by declaring the betrothal between Giuliano and his mistress legitimate. Not as decisive or pragmatic as his cousin, Clement nevertheless played a leading role for the two popes preceding him, largely for his diplomatic adroitness. Both England and France named him cardinal protector to defend their interests in the curia. Leo appointment him papal vice-chancellor in March 1517 and in May 1519 made him papal legate to Tuscany, where he governed Florence. In 1521, Clement’s efforts led to an alliance between the pope and the new emperor, Charles V, whose candidacy Leo had opposed. Though he was a prospect for the pontificate when Leo died in 1521, Clement lost the election to Hadrian VI, the former Adrian Florensz and bishop of Utrecht. Hadrian was selected chiefly for his commitment to reform and his relationship with the emperor, whom he had served as tutor in Burgundy, but the Medici cardinal still continued his leading diplomatic role in the curia under the new pope. Hadrian died unexpectedly less than two years after his elevation, leading to a protracted fifty-day conclave to determine his replacement. This time Clement was the candidate favored by Charles and the cardinals selected him on November 19, 1523. Clement’s eleven-year pontificate saw his political diplomacy turn into a marked weakness as he failed to act decisively on two fronts: the Habsburg-Valois rivalry between Charles V and French king Francis I, and the ongoing religious controversy within the church revolving around Luther. After the new pope’s election, he failed to renew a defensive alliance between Charles and the French intended to protect the Eastern front of Europe against the Turk. He furthered angered Charles in 1525 by joining the League of Cognac with France, Milan, Florence, and Venice. Clement’s position was weakened in 1526, when the French lost to Charles’s forces at Pavia, leading to the imprisonment of Francis himself. Bolstered by Swiss troops, Charles eventually sacked Rome in May 1527, laying siege to the city and desecrating many of the architectural and artistic gains made under the Renaissance popes. It also effectively made Clement a prisoner in Castle Sant’ Angelo for the next six months. He was released in December 1527, but fled the city to reside in Orvieto and Viterbo until October 1528. Reconciliation occurred only when Clement, still largely at the mercy of Charles, came to the conclusion that the Reformation in Germany and the threat of war with Ottoman forces were greater threats to them than each other. The new peace was confirmed when the pope crowned Charles at Bologna in February 1530—the last pope to so crown an emperor. While Clement’s political foibles as pope proved more embarrassing publicly, his inability to stem the tide of the Reformation had more lasting consequences. Unlike his predecessor, who had eagerly sought a council, Clement resisted it despite pressure from Charles. He sent Lorenzo Campeggio as papal legate to the 1524 diet in Nuremberg so the cardinal could support Charles’s Edict of Worms, which had made Luther an outlaw in the empire. The recurrent conflicts between Charles and the pope over the next few years, however, kept the emperor from pressing the matter. Charles eventually recessed the 1526 Diet of Speyer by suspending the edict, thereby allowing Protestantism more time to grow. Clement eventually named Trent as the site for a future council, but he continued to delay its convocation. As interim measures, he declared that a reform of the curia was needed because of the excessive accumulation of benefices and he promised a special investigation of all Roman benefices by a team of auditors, though it never came to fruition. While he had applied some of the reform dictates from the Fifth Lateran Council in his Florence diocese, that same commitment to reform never followed under his pontificate. Clement’s religious and political timorousness was most exemplified by his handling of the Anne Boleyn affair. The saga started in 1527, when the English king, Henry VIII, sought to have his marriage to Catherine of Aragon annulled. Clement needed to keep the peace with Henry, who had been a supporter of the papacy against the early reformers, but Henry’s wife happened to be Charles’s aunt. Since Clement was at the time still imprisoned by Charles, he reserved judgment on the matter. 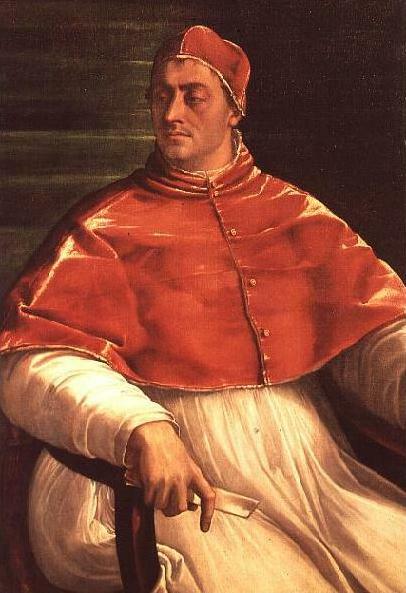 Under pressure from Charles, the pope finally had the case transferred to Rome in 1529 and came to excommunicate Henry only in 1533 and void both his divorce to Catherine and his remarriage in 1534. The protracted affair led to England’s decision to forge religious independence from Rome and eventually to accept the Reformation. Beyond these prominent public failings, Clement generally represents the last of the Renaissance popes before the era of the Counter Reformation that began with the Council of Trent under Paul III. Despite the fiscal constraints left him by the exhausted papal treasury of his cousin, Clement remained a patron of Renaissance art and letters, supporting the Florentine historian Francesco Guicciardini, the famed political thinker Nicolo Machiavelli, and artists Michelangelo and Raphael. He commissioned Michelangelo to paint the Last Judgment in the Sistine Chapel before his death. Clement soon thereafter died on September 25, 1534 and was buried in Santa Maria sopra Minerva.